Flemington trainer Danny O'Brien holds the keys to Saturday's Caulfield meeting with a host of chances that could become autumn carnival players. Headlining O'Brien's big team is dual Group 1 winner Star Witness, who makes his return in the Listed BMW Manfred Stakes. Star Witness , who hasn't raced since finishing runner-up to Black Caviar in the Group 1 Patinack Classic, is a short priced favourite to start his three race autumn with a win. TAB Sportsbet has installed the colt at $1.70 for the 1200m assignment ahead of Dusty Star at $7.00. Star Witness, a Group 1 winner at two and three, is being aimed at next month's Australian Guineas before a possible trip to Royal Ascot. In the race before the Manfred Stakes O'Brien will put the Blue Diamond prospects of Cape Canaveral on the line in the Listed Chairman's Stakes. The colt, like Star Witness, is by Starcraft and has been supported in early betting and is on the third line on debut at $5.50. Sydney youngster Hollyweird is the $3.20 favourite ahead of the heavily backed Command colt Atomic at $3.70. In the Selangor Turf Club Handicap, Eraset resumes from a break and on his good fresh record is a $4.00 chance. In the opening race, the Sandown Park (UK) Handicap, Frenetica is a $9.00 chance of making it three wins from her last three runs. In the Sportingbet Handicap over 1700m, O'Brien is hoping Fashion Black can bounce back to her best form after an uncharacteristic run last time at Flemington. 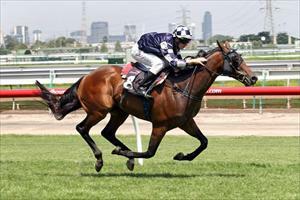 The mare had won her previous two starts and is a $7.00 chance. O'Brien doesn't have a runner in race six but in the following race his in-form Cabeza, pictured above, steps up to 2000m. The Zabeel gelding, who has scored easy wins at Moonee Valley and Flemington at his last two starts, is a $2.40 favourite in The New Saturday Age Cup. In the final race, the Betfair Handicap, O'Brien saddles up $8.00 chance Pins On Ice who had a tough run form an outside gate last time at Flemington but has drawn better and drops in weight this Saturday. O'Brien, currently equal fourth on the metropolitan trainers premiership, has saddled up nine city winners from his last 25 metropolitan runners.